New variations of the TL-122 keep turning up, but this one is extra special. This one was also sent to me by Tony Fitzgibbon. 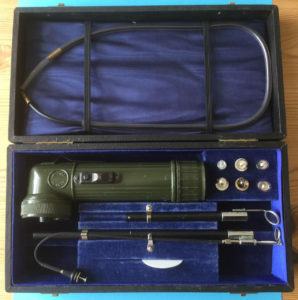 It’s an English Shimwell Alexander torch with small inspection mirrors and fiber optic cable. It’s ex Ministry of Defence. Not sure what it was used for, but it looks very professional in its carrying case! The fiber optic cable is plugged into the adaptor mounted into the lense ring. Keep sending me any new variations you might come across! Check out the full article on TL-122 flashlights.